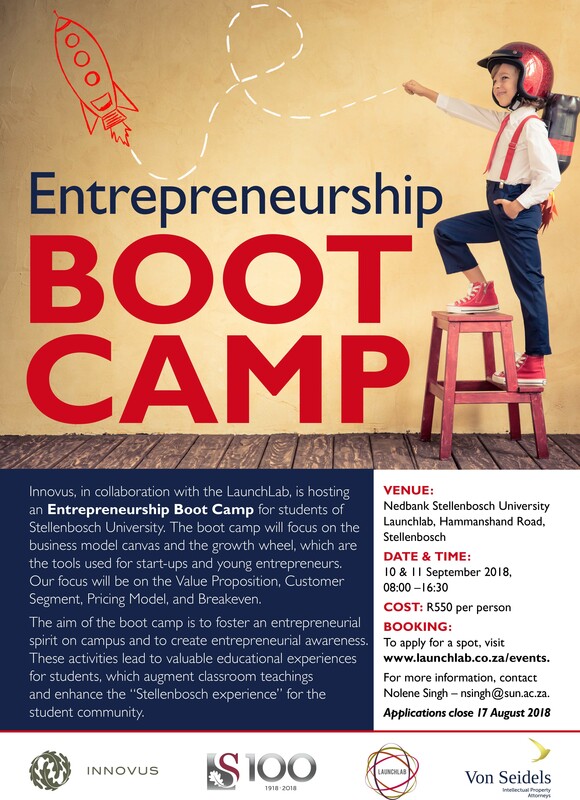 Innovus, in collaboration with the LaunchLab, is hosting an Entrepreneurship Boot Camp for students of Stellenbosch University. The boot camp will focus on the business model canvas and the growth wheel, which are the tools used for start-ups and young entrepreneurs. Our focus will be on the Value Proposition, Customer Segment, Pricing Model, and Breakeven. The aim of the boot camp is to foster an entrepreneurial spirit on campus and to create entrepreneurial awareness. These activities lead to valuable educational experiences for students, which augment classroom teachings and enhance the “Stellenbosch experience” for the student community. For more information, click here to download PDF.